This page includes links to all of our Wall and Solid Wall related DIY how to projects. Here in this area you will find how to project guides and information on insulating walls, creating openings in walls, how to replace wall ties and how to create a partition wall. Browse through the below list and click on your chosen link to view the project information. Flooring - floor joist spans - Learn how to tell if a wall is load bearing or not plus general advice on load bearing walls, safe floor joist spans and the associated building regulations for floor joists. Bricks are the most common external building material in the UK because they look quite attractive, they are relatively cheap and less skilled to manufacture, they offer an easy material to form shaped walls, and they are portable because they are each only small, unlike building with stone blocks. Bricks also have regional characteristics depending on the clay they are fired from. For instance London Stocks come in shades of yellow through grey and even slightly pink, whereas a sand-faced Fletten is more, well, brick coloured! Older brick walls may be solid walls, but modern buildings have cavity walls to imprive insulation and damp proofing. Modern internal walls are most likely to be constructed in blockwork. Concrete, Thermalite or clinker blocks are cheaper to buy and quicker to lay, and as they are not seen once construction is completed, it does not mater that they look utilitarian. The two skins of a cavity wall need to be tied together and we have a project explaining how to do this in this section. We also have tutorials and guides on laying bricks, replacing damaged bricks, building a wall, and pointing and repointing walls. We have some helpful calculators on the site including mortar mixes and gauges. Since to dawn of time man has built walls to keep things out; like lions and floodwater, keep things in; like sheep and children, and to support a roof so he can keep warm and dry. The materials used for walls have traditionally consisted of any widely-available natural material, so that they can be easy transported and are therefore reasonably cheap to use, repair and replace. In the UK we have come a long way since building walls out of wattle and daub (a frame of bent willow and a mixture of horse manure and mud, forming a clay that sets hard in the sun). Speaking of walls I thought I would share my favourite wall Joke with you "What did the fish say when he swam into a wall? ………………Dam" I said it was my favourite, not my best! 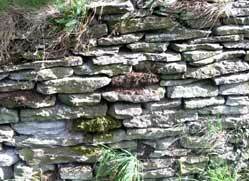 Solid walls are most commonly made of stone (although they can be made of cast concrete or brick). When local stone is used it often impact on how the houses are built because of the properties of the material. Soft stones like sandstone are easy to shape and carve, but they are soon weathered and worn by the elements, harder stone like granite is more difficult to work, but it is hardly affected by the elements at all, even after long periods of time. Very hard and brittle materials like flint and slate are almost impossible to shape into blocks and so they need to be used in almost their natural from and incorporated into the building using a skilled process of selection to get a wall of a uniform shape. Local stone colour also affects how the buildings look, for instance think of the typical dark stone cottages you see in Yorkshire and North Wales, as opposed to the golden Ashlar in Bath, or the grey granite of Aberdeen. If your walls or timber joists are damaged by damp and rot then we have projects to help you repair, replace and treat these conditions in this section. If you have cracks in your walls we help you diagnose the cause, and repair the damage. If some local graffiti artist has been to work we have a project on graffiti removal, but you might want to check it is not a Banksy first! If you want to Do it Yourself you will find lots of helpful projects and guides including video tutorials on subjects such as fitting skirtings and architraves, painting walls and ceilings, tiling, rendering external walls, and if you want to get rid of a wall we explain how to remove a wall without compromising the integrity of your house and even using a wrecking bar!